Jhono Bennet (UJ, Department of Architecture; 1to1 – Agency of Engagement). The presentation of the teaching statements was followed by a panel discussion with respondents from both industry and academia. Key Respondents include: Valentina Manente (architectural researcher/professional), Motebang Matsela (Community organization Resource Centre) and Denver Hendricks (HOD, UJ, Department of Architecture). 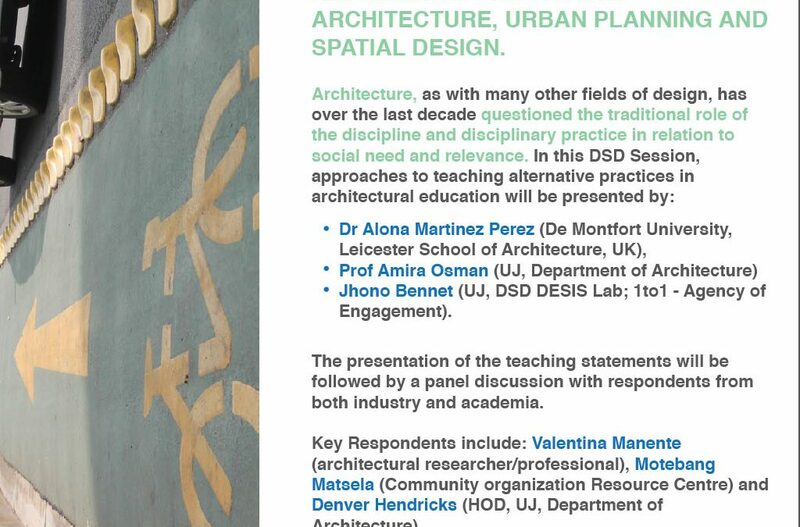 When I joined UJ in 2012 and was asked to teach a component of ARCHITECTURAL PRACTICE called ALTERNATIVE PRACTICE, I thought this department/institution is far advanced compared to others! By “elevating” what is considered “alternative” into an acknowledged position, as a formal module, I believed that they were well on the way towards the transformation of teaching and the profession. Prior to that, I was made aware of the UJ architecture department by my colleague and mentor, Prof Roger Fisher. We saw FADA as an exemplary situation where the design disciplines were under one roof – little did I know that you had to navigate locked doors with access cards! (The DSD DESIS Lab weekly discussions have helped break down these barriers). Having said that, it was still a welcome change from my previous institution where much of the work I did had to be “sneaked into” the programme as it wasn’t considered important enough or professional enough. This was before “community engagement” became popular. I was also aware of Alex Opper’s work which had a similar focus to mine, his language being more poetic, he wrote about “folding the studio into the field”. My teaching approach is underpinned by a theoretical framework based on ecosystem thinking, open building and the concept of ‘catalysts’ as an approach to community engagement. The intention is to provide future architects with the tools to practice in contexts which conventional architectural practice cannot provide for. South Africa is a divided nation with divided cities as a result of its political history. The idea of complete, integrated, sustainable, human(e) settlements and multi-layered environments, realised through alternative design, finance and delivery mechanisms, that acknowledge built environment levels and diverse agents of decision making, is still a far-away ideal. My design teaching practice has focused on instilling the values of citizenship and design activism by emphasising the belief that design can make a difference and serve a higher purpose. I have done this by tapping into the unique skills of architects in addition to borrowing from other disciplines, as innovation is not necessarily embedded in the narrow confines of a single discipline, and mostly exists at the interface between disciplines. In my courses, architecture is presented as a social act, based on social agreements, serving the needs of ‘the individual’ as well as ‘the collective’, and helping to manage the relationship between them. By premising my pedagogical approach on these concepts, I aim to enable my students and our partner communities achieve more awareness of their agency, influence and decision-making capacity in the built environment. In projects that I led, activism has mostly been in the form of ‘service learning’ and in providing documentation, design and/or building services with the intention of achieving education, empowerment and improved negotiating power for all participants. In the contexts I used for student projects, mostly inner city and township settings, I have aimed to combine ‘learning goals’ and ‘community service’ in a manner that aims towards ‘knowledge exchange’ as opposed to ‘knowledge transfer’, and to encourage a search for design and technical solutions through deeper understanding of people, place and context, rather than deriving solutions in isolation, using abstract theories that may not have relevance to partner communities. I continued to work with these concepts and aims during my time at UJ, and this is reflected in the work I did in UJ_UNIT2 (http://uj-unit2.co.za) and also in the establishment of HUE_UJ research field and elective stream (http://h-ue.co.za).